Federal Communications Commission Chairman Tom Wheeler has proposed what could become the first privacy regulations for Internet service providers. The Federal Communications Commission is proposing, for the first time, privacy regulations for Internet service providers. The goal is to let consumers weigh in on what information about them gets collected and how it's used. As they connect us to the Internet, ISPs have insight into our lives — websites we frequent, apps we download or locations we visit — and may use that data for their own promotions or sell it to data brokers to be used for marketing or other purposes. FCC Chairman Tom Wheeler tells NPR's Robert Siegel that ISPs do have to collect a lot of this information simply to run their businesses. "All we're saying in our proposal is that you, the consumer, ought to have a say in whether they can repackage and use information, which is basically your information, not their information," Wheeler says. 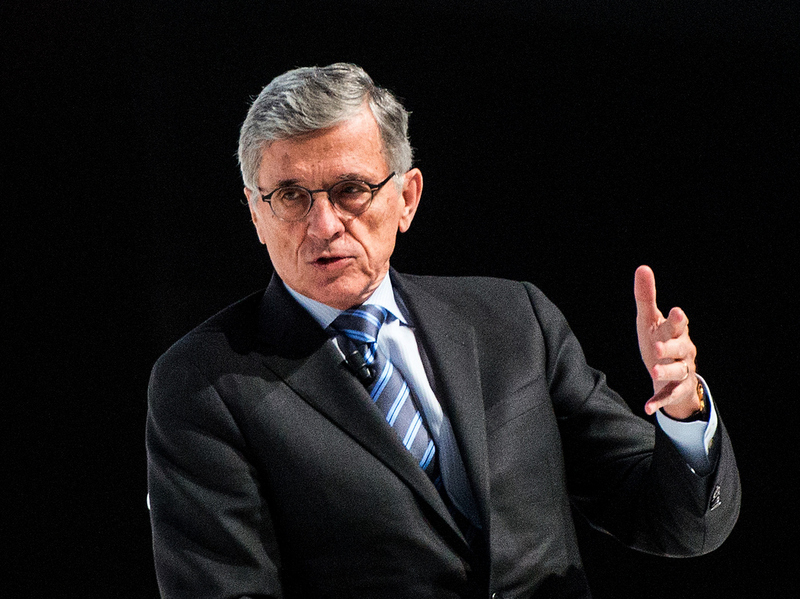 Wheeler's plan, expected to be formally proposed on March 31, would let consumers opt out of programs allowing ISPs to use the data to offer you other services themselves, but would require explicit opt-in consent for data to be shared with third parties. And one interesting question is how this may factor into the prices that ISPs would then charge consumers, given the value of the private information. For instance, AT&T has an ultra-fast high-speed Internet offering that allows subscribers to opt out of Web tracking for an extra fee. "What we're saying is that we want to empower consumers," Wheeler says. "First you empower consumers to say, 'Do I want my information used?' Then you empower consumers to say, 'Is there a value that I put on my information?' and work some kind of a deal with the Internet service provider to reflect that value." As NPR's Alina Selyukh has reported, telecom companies are resisting the FCC's push to regulate their privacy practices. The companies argue that this puts them on unequal footing compared with websites and services such as Google that also collect a lot of information about people's digital tracks. And those companies are overseen by the Federal Trade Commission, an enforcement agency more than a rule-making one. "We're following the same kind of conceptual framework that the FTC has," Wheeler says, "and that's basically, hey, there should be transparency, consumers should be able to know what's being collected and how it's being used. They should have choice about that and whether it is going to be used — and that information should be kept secure so that it doesn't end up in the hands of nefarious forces." The proposal stems directly from the FCC's new so-called "net neutrality," or Open Internet, rules, which expanded the agency's authority over Internet providers. The fate of those rules is pending in the D.C. Circuit Court of Appeals. "I think we're going to find a decision coming out of a court in the next few weeks," Wheeler says, "and we're confident of our authority in this matter." Moody's this week said the FCC's privacy restrictions could hurt the credit ratings for broadband providers like Verizon, AT&T, Comcast and others, according to Reuters. But Wheeler argues the data collection restrictions wouldn't hurt the industry. "The threshold question is we get to make the decision as consumers. And I can think of reasons why I would want my Internet service provider to do this," he says. "So I don't think that this is going to end up shutting down their ability to do things and to monetize the information that they see going over their pathways. But it's going to give me choice."